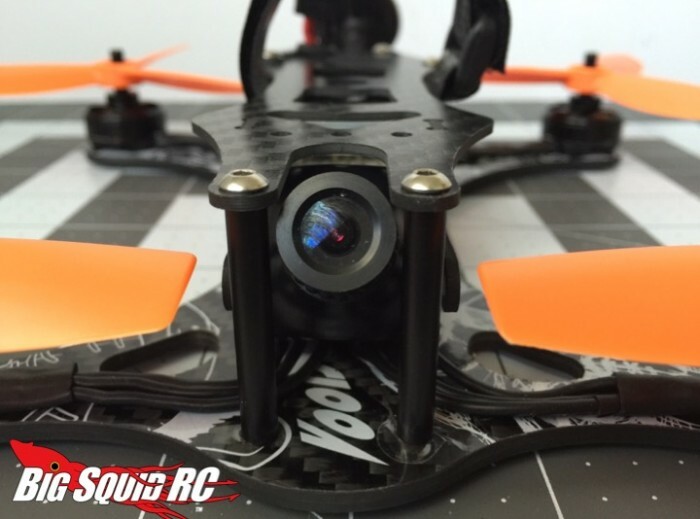 Voodoo Quads VDQ210 FPV Racing Quadcopter – Build & In-Depth Review « Big Squid RC – RC Car and Truck News, Reviews, Videos, and More! Good afternoon, loyal Squids! 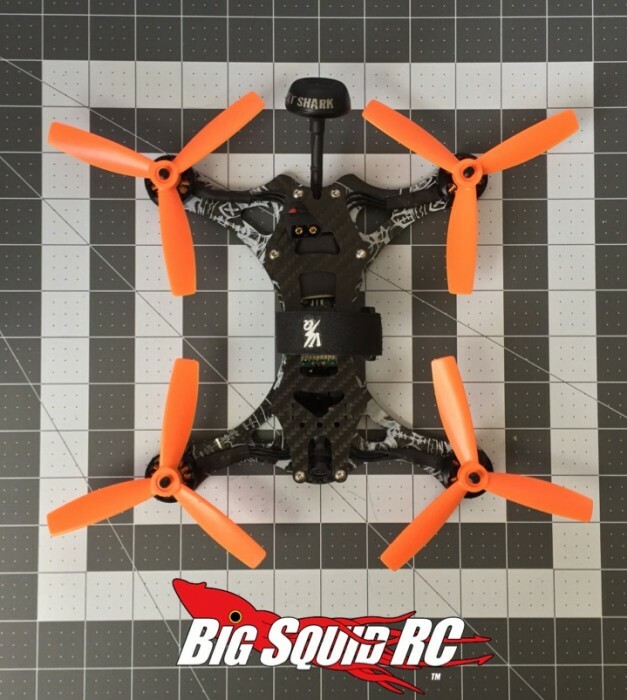 RedPandaFPV here back with yet another mini FPV racing quad review. Today we will be taking an in-depth look at the very-cool-looking VDQ210 from Florida-based Voodoo Quads. One look at the pictures of this baby and it’s easy to see that the VDQ210 boasts a very unique design that helps it really stand out in a sea of “flying bricks”. I decided to build the “Race Edition” of the frame. That means the bottom plate is 3mm thick (for a lighter build) as opposed to the standard edition which sports a 4mm plate (and a $12 price increase). It’s worth noting here that if you decide to go with the thicker, 4mm version (which you absolutely should), Voodoo Quads offers a free, one-time replacement if you break it, regardless of the cause. NOTE: This review is for the quadcopter frame ONLY. Nearly all high-end FPV racing drones are sold piece by piece and your final electronics and running gear selection is completely up to you. You can see the components that I chose listed below. These types of frames can be set up a variety of different ways for a variety of different flying styles. With that being said, let’s take a look at the criteria for reviewing the frame itself. Build Quality & Ease of Assembly: Are the materials used of a high quality? Is the hardware well machined and the carbon fiber finished properly? Does the frame come with all of the necessary pieces needed to complete? Is there excess flashing where the frame was cut? Does the kit include clear instructions for assembly? Does all of the hardware fit precisely and smoothly? Is the fit and finish nice and tight? Innovation: Does the frame boast any unique features, such as a clever camera mount, cable routing system, a unique layout or any other one of a kind features? Flight: How does it fly? Is the weight distributed properly? Does the geometry of the frame lend itself to responsive control? Can it be tuned easily? Does it hold together in the air? Durability: Can it stand up to the punishment we dish out?! Check out the VDQ210 product right here for some more specs and features. The sleek lines, smooth curves and unique silhouette definitely make the VDQ210 a sweet looking rig, but are good looks enough to call this one a winner? 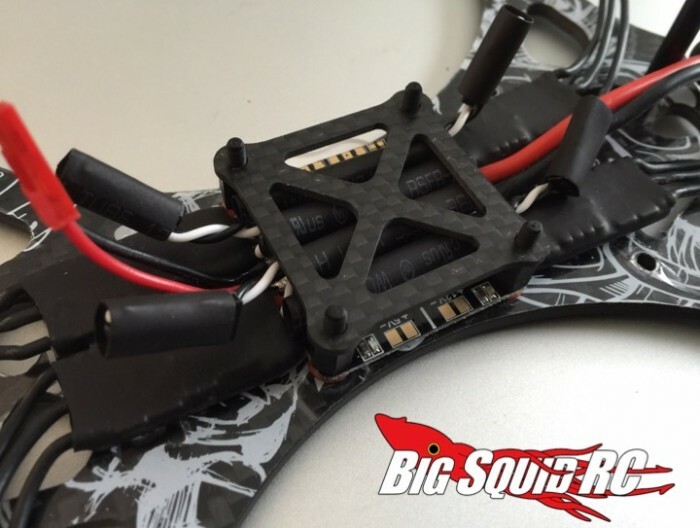 Read on to find out if this little drone can stand up to the Big Squid Beatdown! Flight Battery: 4S 1300mAh 60C Lumenier LX batteries w/XT60 connector. Competition: Despite it’s appearance, the VDQ210 is actually classified as a true X-Frame. This means that all 4 motors are equidistant from one another and that the frame was designed with centralized mass in mind. This style of frame puts the Voodoo in the same category as other X’s such as the XHover Element, Lumenier RaceBlade, Armattan F1, Catalyst Machine Works Speed Addict 210, ImpulseRC Alien 5″ and the ShenDrones Krieger, just to name a few. All of these frames look wildly different from one another, but I choose to classify them all under the same category. This is due to their geometry, weight distribution and measurements as well as the fact that they are all designed for a 5″ prop and similarly sized motors. Needed to Complete: A lot. Everything! This is about as far from a “Ready to Fly” (or RTF) option as you can get. See the above list for a few equipment suggestions. The VDQ210 is sold as a frame ONLY, but can also be purchased as a fully-customizable RTF package. The frame itself is a kit in the truest sense of the word. 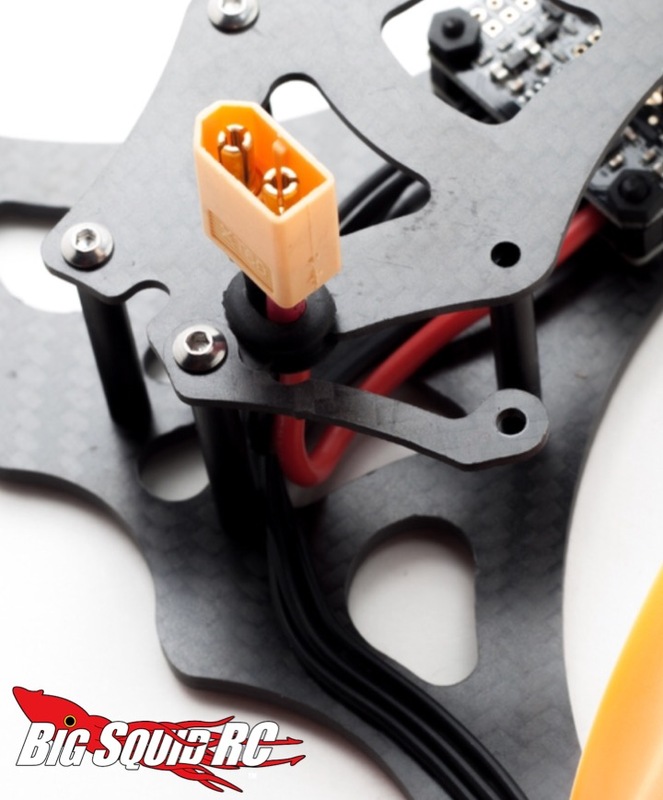 Everything from the flight controller and props to the battery and solder leads are all required and must be purchased separately. 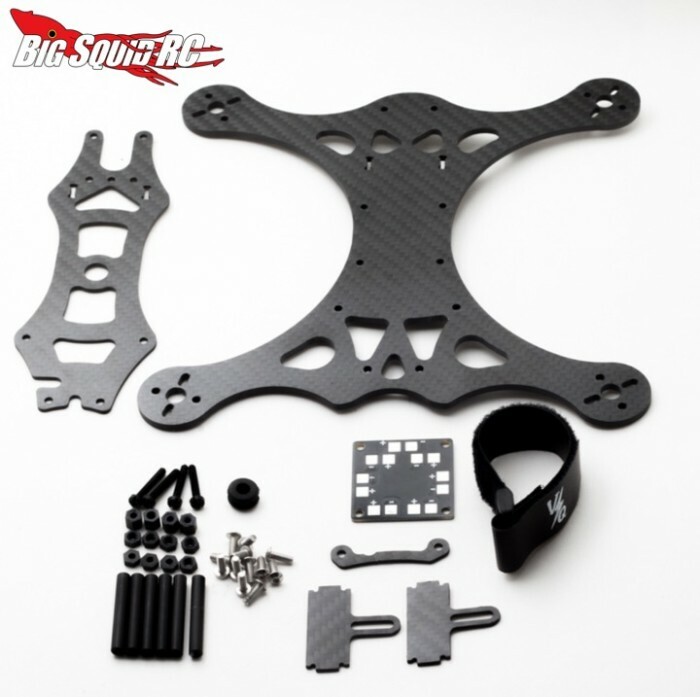 I have said it before in other reviews and I will say it again: Building this; or any other purpose-built, FPV racing or freestyle quad, is a process. A fun, rewarding, and extremely educational process that, in my opinion, is half the fun of owning these machines. With that in mind, it is very important to note that some intermediate-to-advanced soldering skills will be required here. Make sure you have a nice, clean iron, plenty of high quality solder and flux, a good set of “helping hands” and a bright light source before diving into assembly. Setup Notes: My flight controller is running BetaFlight 2.3.5 with the optional AirMode enabled. As I stated in my last review, there are many available guides (and even more opinions) available on how to tune a mini quad, so I will spare you each and every detail here as it will all be covered in a future article. 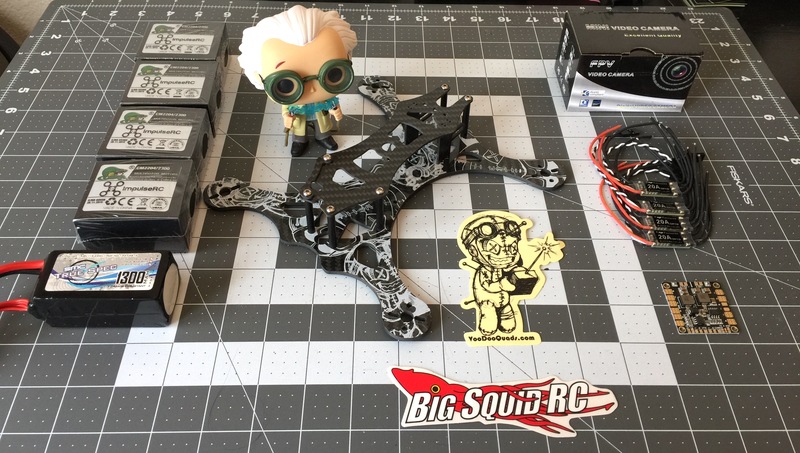 There really is no such thing as “one setup to rule them all” when it comes to FPV Racing. Each machine, pilot and course is unique and so must each setup be. Configuration of the flight controller, motors and ESCs was all done through the CleanFlight Configurator which can be downloaded as a Google Chrome application. The CleanFlight Configurator runs just fine on both Mac’s and PC’s, though there are definitely some gremlins when it comes to installing drivers on PC. Build Quality & Ease of Assembly: The VDQ210 is a very thoughtfully engineered frame. The overall design is awesome and the look of the frame is sure to turn heads at your next race. The kit arrived in what I would describe as very… “spartan” packaging. No fluff here. Just your parts in a plastic bag, a few stickers and one label. The aluminum standoffs and stainless hardware was of excellent quality and machined very nicely. All of the pieces fit together well and the threads were all evenly machined and snug. My one complaint regarding material quality is with the carbon fiber. I noticed quite a few rough edges and sloppy holes on the frame. A few of the edges were slightly splintered and some of the screw holes were a bit rough as well. This meant that I had to take some time with a fine file and refinish the edges to avoid unnecessary delamination of the carbon. (Remember, always wear a mask when finishing carbon fiber, and sand wet if possible!) It’s worth noting that these rough edges could have been due to the fact that I was sent a “review frame”. Even so, the finish of the carbon left something to be desired. The VDQ210 did not come with any instructions. At first glance, this may seem like an oversight, but it’s not. The entire frame is made up of only a few different parts and assembly is very intuitive and self-explanatory. It’s clear that when designing this frame, Voodoo wanted it to be a blank canvas for the customer. If you get turned around while building, there are plenty of build guides available online as well. Innovation: In addition to the unique shape and design of the VDQ210, the frame also has a few nice little touches that are worth mentioning. The way that the camera plates are captured into the top and bottom plate is nice and makes for a secure camera mounting solution. If you choose to forgo the camera mounting plates, the top plate is also pre-drilled for the ubiquitous HS1177 mounting bracket common on other builds. The size and shape of the base plate means that you can get creative with your electronics layout as well. Most quads this small require you to mount your ESCs out on the arms. Not so with the VDQ210. You can see above how I was able to really consolidate all of my electronics down the center of mass and eliminate any ESCs from being out in harm’s way. This makes for protected electronics as well as optimal weight distribution and also helps in making the quad easier to tune. Another cool touch is what I call the “battery cable capture plate” which you can see in the photo below. Included with the frame is a small carbon fiber arm that affixes to the rear of the top plate, locking in the battery cable. This is beneficial for two reasons. One, it keeps your cable from flopping around and potentially getting caught in your props. Two, it takes the stress off of the solder joint where the cable connects to the power distribution board. These little quads are meant to be crashed and batteries are often ejected. This can be problematic if there is nothing to take up that stress. The VDQ210 solves this little problem elegantly. Overall, the design of the frame is unique and I appreciate that you are not locked in to any one particular build or layout. 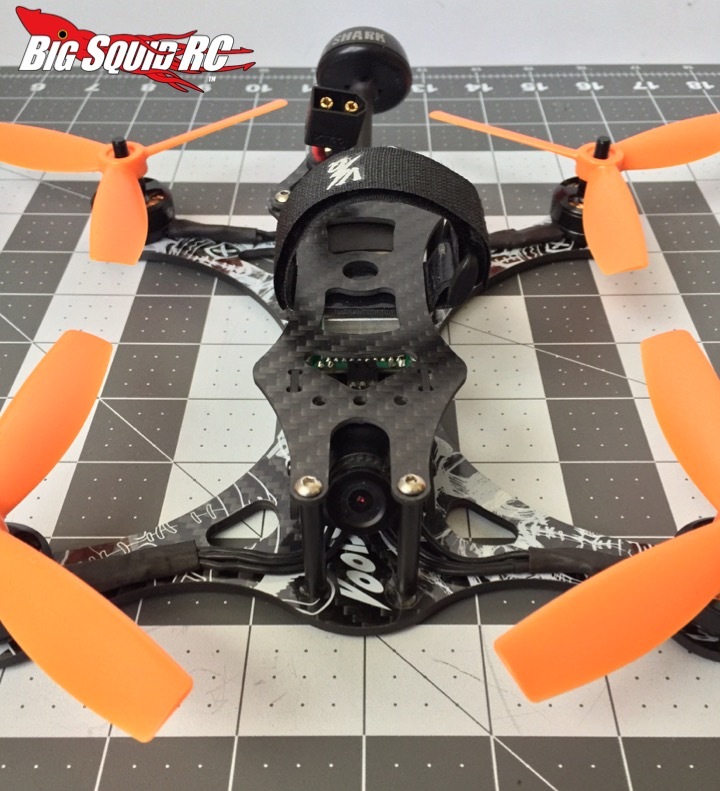 Flying: As with any good frame design, flight is where the Voodoo earns its paycheck. Being a geometric X has a number of benefits. The VDQ210 is incredibly easy to tune and is even a perfectly capable craft without any adjustment of the stock settings in your flight controller firmware of choice. The layout of the frame allows you to centralize all of your running gear which makes for excellent balance as well. Despite my minor gripes about the precision of the machining and the apparent low quality of the carbon fiber, the VDQ210 is extremely stiff and, when set up correctly, suffers from almost no micro-oscillations or vibrations common on drones this size. As you can see in the video below, this little guy is locked in and handles beautifully. The only issue I had was a slight bit of oscillation on hard braking and turns. This was devilishly difficult to tune out and I think it may have actually been caused by a wonky motor. Overall, the VDQ flies superbly. It can carry a GoPro with ease (with the proper battery and prop set-up) and, like a lot of mini quads, flies better the heavier it is. Durability: High marks all around here. These frames are designed to be tough and meant to be crashed. After all, if you’re not crashing, you’re not pushing yourself! As noted above, Voodoo Quads offers a one time replacement on the 4mm version, regardless of cause. That says a lot about their confidence in the frames durability. In addition to your standard-issue crashes (flying to low and cartwheeling through the grass, clipping tree branches and falling to the ground, etc. ), I decided to really put the Voodoo through its paces. First, I threw (not flew!) the frame (complete with GoPro, battery, props and everything else) out of a moving car going about 40MPH down my street. Then, I decided to fly as high as was possible while still maintaining line of sight (I’d say about 250 feet) and cut power to the quad, letting it reach terminal velocity and smash into the pavement. After that, I decided to keep it simple and fly WOT (or Wide Open Throttle) into a tree. So what was the net result of all of this torture? Aside from many, many broken props, a punctured lipo (yikes!) and an ejected GoPro, almost nothing! There are a few minor cuts and scrapes to the edges of the arms where the motors mount, and some of the carbon fiber on the top plate is delaminating, but other than that, the VDQ took it all in stride! The potential delamination is definitely cause for concern, however, and may be again related to the quality of materials used. This little red flag is really the only thing counting against the VDQ’s overall durability rating. Time To Bash: C This is no RTF drone. Remember that building these types of quads is half the fun! The design of the VDQ210 allows for a very clean and efficient build, though, and you will be flying in no time. It’s definitely worth repeating that this ship is better suited to more experienced builders. Workability: A Wrenching on this frame is a joy. The removal of 6 screws is all it takes to gain full access to your running gear. Nothing is awkwardly mounted and replacing parts is a breeze. Car Show Rating: A+ Visually, the VDQ210 stands out amidst the crowd. With it’s curved lines, unique shape and innovative base plate, this quad looks fast just standing still. I went with a custom Voodoo logo “sticker-bomb” job on mine and I have to say that, visually, this is my favorite looking frame that I currently own. Bash-A-Bility: B I most certainly used and abused this frame and it took it all like a champ. The only reason for the B is simply due to the delamination of the edges of the carbon fiber. I spent a lot of time going over this frame with a file and I feel like that should be handled at the factory. Fun Factor: A What a fun little airframe! Not only is the VDQ210 a blast to tear up the skies with, it was also incredibly fun to assemble. This thing is a pocket rocket! Handling: A The geometry of the frame means that it handles like its on rails. This, in addition to durability, is probably the most important metric and the Voodoo shines. It’s lightweight, agile, responsive and fast. What more can you ask for? Value: C Coming in at $72.95 for the race edition and $84.95 for the 4mm version, the VDQ210 is priced competitively with other frames in it’s class. However, the quality of the carbon fiber leaves something to be desired and other frames at the same price point seem to have much higher quality CF. Parts Availability: C Replacement parts are available directly from the Voodoo website and there is plenty of stock available. However, I don’t believe that parts are available anywhere else. BigSquid Rating: B+ The VDQ210 from Voodoo Quads is an awesome FPV racing drone and, aside from a few marks against the overall rating for materials quality, I definitely recommend it. It’s a blast to build, even more fun to fly, and looks unique to boot! Thanks for reading! 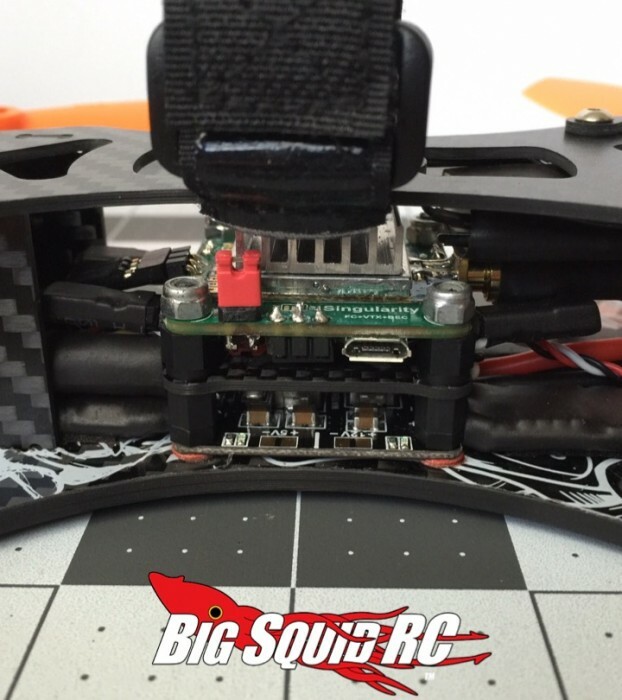 Stay tuned in for lots more FPV news, reviews and product reveals right here on Big Squid RC! Want more FPV news from us? Click here!